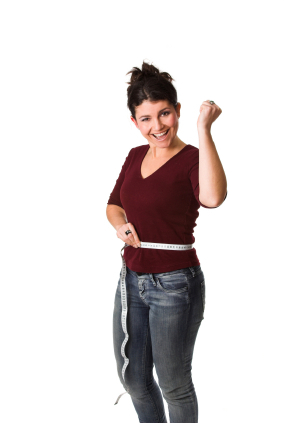 Tips To Help You Safely Lose The Baby Weight. If you’ve recently had a baby and are hoping the weight you gained carrying your little one won’t stay around the nine months it took to get there, you’re not alone. After baby has arrived and you get into a comfortable routine, many women start to think about getting in their pre-baby clothes. But with changes still taking place with your hormones, a new baby to take care of, and a sleep schedule that leaves you wanting more, losing that baby fat will take patience and planning if you want to do it right. “It took nine months to gain, so be patient,” says Debbie Mandel, M.A., author of Addicted to Stress. Walters suggests an 8-ounce glass of 100 percent grapefruit juice and ½ cup of low-fat yogurt topped with low fat granola or ½ cup of oatmeal as healthy choices. Walters says women need to embrace the “90/10” philosophy when it comes to losing weight. “90 percent of the time you should fill up on foods like lean proteins, fruits and vegetables,” said Walters. “The remaining 10 percent of the time, enjoy a piece of dark chocolate, frozen yogurt or slice of pizza.” She points out that by satisfying your hunger you won’t feel deprived. New York City based fitness expert and nutritionist Araine Hunt says 70% is diet and 30% exercise. Hunt says that by keeping your carb intake moderate, you’ll keep your energy constant, promoting fat burning. Best-selling author and wellness coach to stars such as Angelina Jolie and Reese Witherspoon, Jackie Keller says women should get started right away. Keep the fat – cut the sugar! It’s time to say good-bye to the sweet tooth cravings you had during pregnancy. Hunt says women should not cut the fat, but rather sugar out of their diets. Merriweather notes that women who’ve had a vaginal birth may be able to do many of the activities they did prior to delivery, c-section recovery activities need to be modified so the healing of scars can take place. The quickest way to getting the body you want might just involve getting enough sleep. Hlivka says sleep is important in terms of weight management because it allows you to burn the calories you take in. ”There’s a decrease in the amount of leptin (an appetite-suppressing hormone) when a person gets too little sleep. At the same time, ghrelin (a hormone that stimulates appetite) increases with a lack of sleep,” says Hlivka. Aim for no less than six hours a night, but set a goal for seven to eight hours of shut eye. When it comes to dieting you may only be thinking about your favorite snacks, but experts say you should also pay attention to what you’re drinking.